Every year, major property companies publish property price forecasts, giving their predictions for how the market will perform over the coming months and years. Given the economic uncertainty that has been thrown up by Brexit, the forecasts for this year have perhaps been of wider interest than usual. The chart below shows the different property expert forecasts for 2017 versus actual price growth recorded by the government’s UK House Price Index, which includes cash sales and Nationwide’s mortgage index. 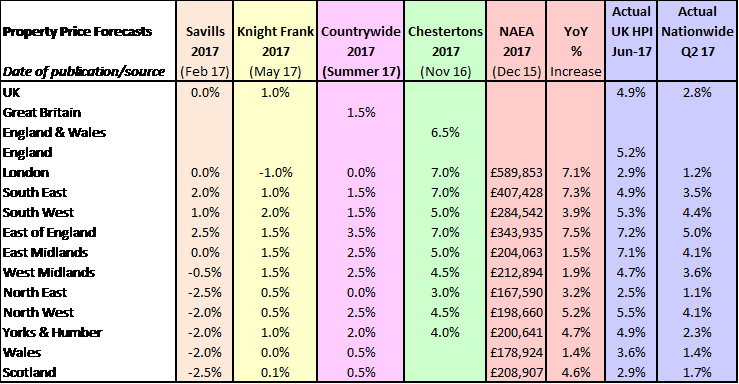 The huge differences between the various companies’ predictions are quite clear, with Savills, Knight Frank and Countrywide at the lower end of the price growth spectrum and Chestertons and the NAEA at the higher end, and they’ve all missed the mark, having predicted either a worse market than we are actually experiencing, or a far more buoyant one. In reality, performance to the half year is pretty much somewhere in the middle. While London has had a small amount of growth, some parts of the capital - particularly at the top end of the market - have seen property prices go into reverse, although this does come after prices almost doubling since the recession. Other areas that Savills expected to experience a fall, including the North, Wales and Scotland, have actually seen fairly respectable growth rates, so far! The South West and East Midlands through to the East of England have performed much better than the experts predicted. Growth rates of between 4% and 7% have been achieved in these areas where minimal growth was forecast. The most accurate predictions appears to have been for the North East, where minimum growth of just over 1% has been achieved versus forecasts of -2.5% to 3%. Wales and Scotland have performed slightly better than expected. Although it might be tempting to criticise the forecasters, bearing in mind the enormously complex property market picture and the speed with which prices can shift up and down, it’s impressive that they get anywhere near to the actual results. And, of course, we are only half way through the year, with those actual figures just running up to June – in other words, some of the forecasts may prove to be closer to the real picture by the end of December. Although the likes of Brexit, affordability and increased taxation are all being blamed for the slowdown in the market, it’s more likely that where there is easing, that’s due to normal market activity over time. We saw huge falls during the credit crunch, followed by huge rises as the market recovered in the likes of London, the South and East, then a more stable market as demand and supply started to match again over time. In the rest of the country, we haven’t seen anything like a rapid recovery and so we are into a new era as far as property price movements are concerned. One key question we will hopefully have answered in the next year is: can prices, as some are predicting, fall, even if they are still lower than they were before the crash in 2007/8? We will also hopefully have a better idea of the impact of government intervention over the next 6-12 months which has been substantial in recent years. New build has been encouraged through Help to Buy Schemes and large build to rent projects while demand for buy to let and the prime market has been dampened by tax increases and in some cases, affordability issues are now hitting the Southern, London and East of England market due to restrictions on 4.5x income spending. So looking forward, there is still plenty of time for the forecasts to be more accurate, but in the meantime, if you want to find out what’s happening in your local market, it’s really only good quality local agents who can guide you as property price and rental movements are now very localised.